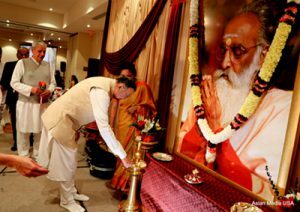 A sangam of swamis and respected teachers from various centers blessed the expansion bhumi puja of Chinmaya Mission Chicago – Badri on September 7, 2018. Pujya Swami Swaroopanandaji emphasized the importance of personal growth of devotees; buildings and attendance may grow but are we growing spiritually within? Respected Shri Shanker Pillai, President Chinmaya Mission Chicago, and Board member CMW welcomed Swami Shantananda, Swami Sharanananda, Swami Mitrananda, Swami Ramakrishnananda, Swamini Kaivalyananda, Shri Gaurang Nananvati from Chinmaya Mission Houston and other CMW lead Sevaks from various centers who showered their blessings amidst pouring rain. 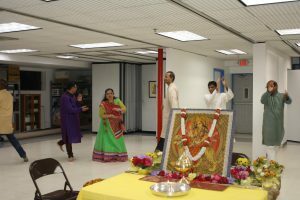 Soon after Pujya Gurudev’s Mahasamadhi, Chinmaya Mission Chicago – became home to Lord Badri Narayana. In the year 1987, Pujya Gurudev named the Chicago Center, Badri, A School of Vedantic Studies and advised to have prana pratishta of Lord Badri Narayana. On Sunday, October 24, 1993 the sthapana ceremony of Lord Badri Narayana was held in the holy presence of Pujya Guruji Swami Tejomayananda. The week-long silver jubilee celebrations included a spiritual discourse by Swami Ramakrishnananda on Brahmasutra: Theory of Superimposition from October 15-20. 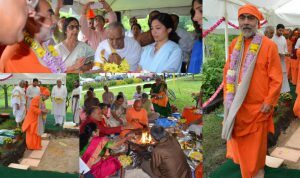 Followed by 108-Kalasa Puja, Homam, Abhishekam and Archana on Sunday, October 21 by devotees in the presence of Swami Sharanananda (CM Chicago), Swami Sarveshananda (CM Dallas), Swami Ramakrishnananda, Shri Shanker Pillai (President CM Chicago), Shri Jetindra Nayar (Yamunotri Center) and Shri Dhiren Khattri (Gangotri Center). Even Mother Nature celebrated Lord Badri Narayana with snow flurries making Chicago truly Badrinath. Following the ceremonies, Swami Sarveshananda held a special session with Chinmaya Sethukaris, Yuva Kendra members and the high school students, the future generation to become Pujya Gurudev’s torchbearers.